Steven Spielberg knows a thing or two about alien invasions. First, they came to abduct and study us in Close Encounters of the Third Kind. Oh sure, in the end they were friendly music lovers, but who can forget the frightening sequence where the unseen visitors lay siege to little Gary’s house and take him away? I was eight at the time, and it scared the hell out of me. Next, in E.T. The Extra-Terrestrial, the aliens came into our homes and went after the hearts and minds of our children. Okay…I’m reaching there. There was nothing malevolent about E.T. The same can’t be said for Spielberg’s latest visitors, however. Based on the 1898 H.G. Wells’ classic novel of the same name, War of the Worlds depicts huge alien machines that move across the landscape and destroy all human life they encounter. And what a gloriously terrifying depiction it is! Tom Cruise is Ray Ferrier, a dock worker from New Jersey who left his wife after the birth of their daughter Rachel (Dakota Fanning). This is his weekend with the kids and Rachel and his teenage son Robbie (Justin Chatwin) are less than thrilled. It is clear early on that Ray is clueless about his children’s lives and needs. The only thing he’s ever cared about is himself. But that’s all about to change. Newscasts from around the globe announce that freak lightning storms are causing power outages and loss of signals. Bored, Rachel turns the channel to Spongebob. Then lightning strikes behind their house—energizing an alien war machine that rises from the earth and begins attacking everything in sight, and the film follows the exodus of Ray and his children as their world is destroyed around them. While on the run, Ray must learn to become a father, and the film poses some fascinating moral questions: What would you do to survive? How far would you go to protect your children? The screenplay remains faithful to its source material. Morgan Freeman provides opening and closing narration lifted directly from Wells’ prose, and the attacking machines are the three-legged tripods of the novel. The invaders begin to spread a red weed that chokes all earthly vegetation and spreads like Kudzu over buildings and stalled vehicles. These aliens feed this plant by sucking the blood from fleeing humans and sprinkling it onto the landscape—a sequence that is ripe with stomach-churning horror as the wind carries some of the spray into Ray’s face. Just as the ‘50s War of the Worlds played on Cold War fears, this new War deals with the post 9/11 world we live in. These war machines do not streak to Earth in meteors. No, they come up from within the earth—right under our feet the entire time. Like terrorist sleeper cells, they are activated on command to begin the destruction of America. As one character comments, “They’ve been planning this for years.” In one haunting scene, the clothing and ash of pulverized Americans fall like rain. As Ray becomes covered with this ash and walks through the streets, the likeness he bears to survivors of the twin towers is truly disturbing. Spielberg keeps the action moving. In one brilliant sequence, his camera moves in and around Ray’s fleeing mini-van. We see the family in close-up as they speak, then pull back to get an overall view of the devastation, then it’s right back into the van for more dialogue. Later, when the aliens send a remote camera—a huge eye—into the cellar where Ray and Rachel have found shelter, the camera follows the machine as it snakes its way through the labyrinth, then whirls back to show the family moving out of its line of sight. The director also knows when to let his camera linger. When a stranger (Tim Robbins) who has been driven mad by his experiences threatens Rachel’s safety, Ray feels he has no choice but to remove this danger. Ray blindfolds his daughter and asks her to sing her favorite lullaby as he goes off to silence the babbling man. The camera stays on her face, allowing us to hear her crackling voice and the faint noises of struggle in the distance. It is a gut-wrenching sequence. In a film of cold technology and spectacular vistas of destruction, Cruise and Fanning manage to keep things very human indeed. Despite her young age, Fanning has proven to be one of the finest actresses in Hollywood, even upstaging the great Robert DeNiro in the recent Hide and Seek. Here, she compliments Cruise’s performance rather than distracting from it. Ray’s transformation from uncaring man-child to protector is made believable by Rachel’s transformation from too-wise child to little girl lost. One would not work without the other. Some may find fault in Spielberg’s choice to portray the end of the world through Ray’s eyes (as in the movie Signs, if the main characters don’t see what’s happening, we don’t experience it either), but I’m not one of them. This War of the Worlds owes more to the director’s Saving Private Ryan than his earlier science fiction efforts. This is gritty, bleak, shocking, and real…until the very end. I’m not referring to the fate of the aliens. If you’ve read H.G. Wells’ novel, heard Orson Wells’ radio play, or seen the ‘50s film, you know what happens to them. I’m talking about the fate of Ray’s family. I won’t give anything away here, but let’s just say that Spielberg nearly ruined the entire film with a sappy, totally implausible “Hollywood” ending. The rest of the film is so uncompromisingly grim, however, that I am willing to forgive this hokum. This is the second collaboration of Spielberg and Cruise. Their previous effort, Minority Report, was my favorite film of 2002. I will look forward to more outings with this dynamic duo. I only hope they don’t go “Hollywood” on us again. I would like to begin this review with a confession: I’ve never read the Hell-blazer comic. Don’t get me wrong, I do love Alan Moore. I’ve read his Saga of the Swamp Thing and Watchmen countless times. I’ve just never picked up an issue of Hell-blazer. Having said this, I hope the comic’s legion of devoted readers will forgive what may be a mortal sin in their eyes: I enjoyed the movie Constantine. For those like myself who have yet to be initiated into the comic’s strange world, Moore has taken Catholic theology and infused it into the film noir detective genre. When John Constantine (Keanu Reeves, not Sting as Moore had envisioned) was born, he was different. He could see things no one else could see—horrid visions of people who were not really people, but “half-breeds”. Some were part angel, others part demon. Of course, his parents thought he was crazy and sent him to an asylum for shock therapy. It didn’t stop the visions, however, and Constantine became so disturbed that he took his own life. As anyone familiar with Catholic doctrine knows, suicides go straight to Hell. John spent only two minutes in that fiery underworld before paramedics were able to revive him, but even a moment in Hell is like an eternity. Now that he knows what awaits him, Constantine has dedicated his life to exorcising demons and killing half-breed monsters in a desperate attempt to earn God’s favor and buy a ticket into Heaven—a goal that has taken on fresh urgency because he’s just learned that he’s dying of lung cancer. Enter police detective Angela Dodson (Rachel Weisz). She’s a Catholic with a problem. Seems her identical twin, Isabel, who was also committed for seeing demons, just took a flying leap from the hospital roof. Angela can’t believe her devout sister would commit suicide and seeks to prove it was murder. When she views the hospital security tapes from that night, however, she sees poor Isabel was all alone. She also hears her utter a single word: “Constantine.” Determined to find out what happened, she tracks John down and asks for his help. As they search for clues to solve this mystery, Constantine explains that God and Satan have a standing wager for the souls of all mankind. Angels stay with God in Heaven, demons stay in Hell with their master. There can be no direct contact with human beings, only “influence peddling”—whispers in the ear that may push the good toward righteousness and the bad toward evil. But now something is very wrong. Soldier demons are trying to force their way onto this plain of existence, and a particularly nasty specter attacks Constantine on the street. What is going on?—and what does Angela have to do with it? Constantine could have been a campy mess, but the filmmakers treat the subject matter seriously. The script does allow for humor when appropriate, but the levity is kept to a minimum. Mysteries unfold for the characters on the screen and the audience as well. As John and Angela try to find their answers, the viewer gets to pick up the rules of the game without long scenes of exposition that would bring the action to a grinding halt. But, as in The Prophecy, the film does play fast and loose with religion. The angel Gabriel (Tilda Swinton) is once more cast as a villain who is trying to make humanity worthy of God’s love (and going about it in all the wrong ways). There is also mention to books in The Bible that don’t exist. Quoting The Bible is not new to horror (Hell, even Nightmare on Elm Street 4 did that! ), but do we really need to make up verses to fit our stories? Maybe it’s just me, but I find this to be laziness on the part of the writers. Here’s a verse that fits the movie to a tee: “You believe because you have seen. How happy are those who believe without seeing.” Constantine does what he does because he has seen Hell, knows it exists, and wants to avoid it at all costs. Director Francis Lawrence, who cut his teeth in music videos, gives us a truly nasty Hell, but his vision of modern day Los Angeles isn’t much better. Naomi Shohan’s production design and David Lazan’s art direction are gritty and bleak. Philippe Rousselot’s cinematography is classic noir with very deep blacks, very bright whites, and very muddy colors in between. And the effects crew has worked hard to turn the streets of L.A. into something out of Dante’s inferno (although I still have no great love for computer generated demons). This is the kind of film that will evoke very strong gut reactions. Based on your love of the comic or your religious background, you will either love it or hate it. I loved it. If you want to damn me for that, go right ahead. Okay, I’ll just come right out and say it: Hollywood has forgotten how to do horror. Oh sure, they still release titles under the banner of horror, but the dark heart and twisted soul of the genre have withered and atrophied under the weight of the studio mandated PG-13 and a reliance on digital effects. America’s Asian counterparts, however, still know how to get it right. And never has a horror film been more beautifully executed than in writer-director Ji-woon Kim’s A Tale of Two Sisters. At its core, this South Korean film is a very grim fairy tale. The two sisters of the title are Su-mi (Lim Su-jeong) and Su-yeon (Mun Geun-yeong). After a mysterious hospital stay, the siblings return home to find their stepmother (Yum Jung-ah) wants to pretend they’re all one big happy family. In reality, this stepmother is quite wicked indeed, and the siblings would love nothing more than to expose her evil ways to their father (Kim Kap-su), if only he would pay them any attention. As if their family problems weren’t enough, Su-mi begins to have tortured visions. She hears strange noises in the hall–as if someone is running around. Doors open by themselves and, worst of all, dark phantoms start appearing in her bedroom. Why does the stepmother have such an intense hatred for Su-yeon? Why were the girls hospitalized? And is this house really haunted, or is everyone in this family mad as a hatter? Ji Woon Kim keeps us guessing as he lets the story slowly unfold before our willing eyes. And what a gorgeously photographed story it is! Mo-gae Lee’s cinematography and Geun-hyeon Jo’s art direction make every shot of this film worth framing. The colors are vibrant and the composition shows a painter’s eye for detail. The sound design for A Tale of Two Sisters is just as exquisite. Quiet scenes where nothing seems to be happening turn into creepy moments that bring you to the edge of your seat with a single noise. And the haunting score by Byung-woo Lee helps to build tension throughout. Revelations in the shocking climax will make you look at the entire film in a new light. This is a movie that screams for repeated viewing. Like The Sixth Sense, Identity, and Session 9 before it, A Tale of Two Sisters will have you thinking long after the credits have ended. This is a psychologically complex, visually dense work that will be talked about in horror circles for years to come. When The Blair Witch Project became a box office sensation, I predicted it would usher in a new era of horror films. I thought everyone with access to digital video equipment would hear the call to arms and start turning out their own shockers. Because the movies would be made for little or no money, there would be no reliance on CGI ghosts and demons. No, these films would be very cerebral and would focus on characters. Movies shot on film stock tend to be one step removed from reality. These new films, shot on video, would not have this problem. They would make everything seem real, and therefore more terrifying. As with Blair Witch, they would build unbelievable dread and suspense until they delivered a climax so shocking that you would have to sleep with the lights on. Sadly, this revolution never happened. But we did get Session 9, a film that does for haunted houses what Blair Witch did for camping. As the movie opens, we are given a guided tour of the long vacant Danvers State Mental Hospital. It seems there’s asbestos in its walls and ceiling. By saying they can get it removed in just 7 days, Phil (David Caruso) and Gordon (Peter Mullan) win the contract. They quickly put together a crew of friends and family so that they can get the job done in that amount of time. If they succeed, a fat bonus awaits. But what else waits for them in this cavernous complex? The pace of this film is deliberately slow. We are introduced to each of our characters and their issues: Gordon feels trapped in his marriage since the birth of his daughter, Hank (Josh Lucas) stole Phil’s girlfriend, and Mike (writer Stephen Gevedon) should be practicing law instead of doing this manual labor. We watch as the group begins to show signs of cracking beneath the strain of the unreasonable schedule and their own personal demons. Gordon is kicked out of his home and must sleep in the work van. Hank just doesn’t show up one day. And Mike has become obsessed with the long-abandoned records room. There, he finds a box containing the reel-to-reel recordings of therepy sessions with a dead mental patient–a girl who suffered from multiple personality disorder. Or was she possessed? There’s a lot to love about Session 9. As the film winds its way through the dark corridors of this decayed asylum, we are given tiny hints and clues as to what is happening within these walls. A sense of paranoid dread is carefully nurtured here and we begin to question what these characters say to one another. Are these people telling us the truth? Can they be trusted? This is not a picture you want to see alone at night. As I said before, video has a way of making things seem real. This, added to the great performances on display here (how can you not love David Caruso’s soft-spoken, “I’m better than you are” demeanor?) makes the film far too believable and the ending far more shocking. When the film was over, I felt as if someone has just given me an electroshock treatment. This is one that you can not help but think about long after the credits roll. In fact, just thinking about it now makes the hair on my neck stand on end and turns the skin on my arms to gooseflesh. That’s just what a horror movie should do. 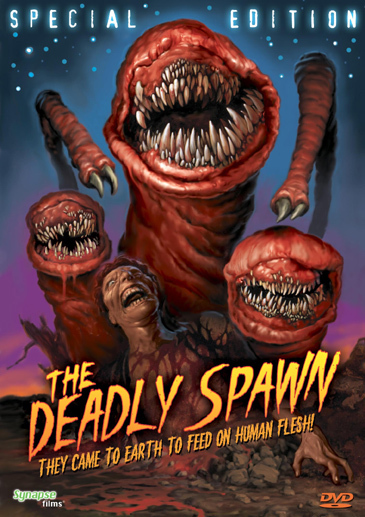 As you may have already guessed by the monster made of paper towels, Douglas McKeown’s magnum opus The Deadly Spawn was shot on an extremely low budget with 16mm film stock. It begins, as so many horror films before it, with a meteorite streaking through the sky. It crashes into the wooded hills of a rural community, where it is discovered a pair of unfortunate campers (2 guys?). As in The Blob, a hungry alien terror slithers its way out of the still smoking rock and quickly devours them. As it eats, it grows. The more it eats, the more it grows. The alien thing moves toward civilization, seeking refuge from a rain storm in the huge and creepy basement of an average American family. For various reasons, the adults who live in this home decide that they need to go down there and are gorily consumed. Heads are ripped off, arms are devoured, and blood sprays up onto light bulbs where it smolders and bakes. Soon, only a group of teenagers and a young boy remain. These kids must now fight to survive. They try to escape the house in one piece, but are met at every turn by that pesky three-headed alien slug from the cellar. And now, it’s not alone. With it’s belly full, it has reproduced–creating hundreds and hundreds of little mouths that swim, climb walls, and…well…eat. How will the world be able to defeat this red menace? Douglas McKeown’s direction is more than competent. There are some nicely composed shots, and a few interesting sequences (the best being the scene where the young boy goes down in the basement and discovers what remains of his parents). Overall, he manages to keep the film moving and gives us some fun scares and surprises along the way. Considering what he had to work with, I’d say he did a fine job. The “actors,” on the other hand, are the real low point of The Deadly Spawn. Sure, they give it their all, and you can tell their hearts are in the right place, but when they open their mouths to speak, it’s all over. But we’re not here for the human characters, are we? The real stars of the film are John Dods’ creatures. His toothy babies are seen actually swimming through puddles on the basement floor, slithering up the walls of the home, and wrapping themselves around rafters in the attic. They rip flesh from bones, eyeballs from sockets, and even cannibalize each other in a pinch. Just looking at them, you would never guess how they were constructed, but knowing what they are made of makes them all the more amazing to behold. If you have experience with trying to put together your own low budget masterpiece, with your friends and neighbors as cast and crew, you’ll respect and appreciate the merits of this movie. These guys actually got this film into limited theatrical release in the early 80s! The fruit of their efforts (and possibly the second mortgages of their homes) is a quaint little horror gem that any fan of the genre can enjoy. 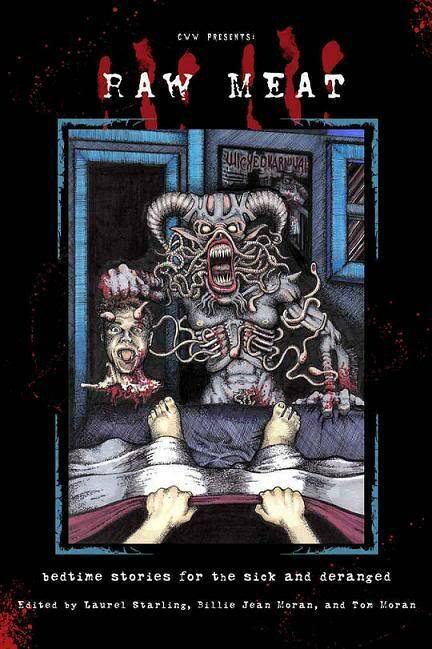 If you’re feeling a bit nostalgic, or if you just love a good B-grade gorefest from time to time, there’s a lot of fun to be had here. I had very low expectations when I picked up the DVD of Cursed. It was heavily reshot prior to its release earlier this year (never a good sign), and the version that did make it into the theaters was despised by critics everywhere. As a result, the film tanked at the box office and was quickly banished to the shelves of the local Blockbuster new release wall–with a huge “Unrated Version” stamped across the jacket. I love Wes Craven. I love Christina Ricci. I once thought Kevin Williamson could write. And “Unrated”? I decided to tempt fate and give this puppy a view. On a dark and deserted road in the Hollywood hills, Ellie (Ricci) and her brother Jimmy (Jesse Eisenberg) strike an animal with their car and the impact forces them into another vehicle, sending it rolling down a hill into the woods. As the siblings try and help the trapped passenger (Shannon Elizabeth), the animal returns to maul them. Ellie and Jimmy survive with a few scratches. Shannon Elizabeth is not so lucky. Turns out this was not the bear or cougar the police believe it was. No, this was a werewolf. The remainder of the film deals with a horror themed club opening, and high school geek Jimmy facing his bullies–all while the mark of the beast, this “curse,” takes hold. Oh yeah, and that original werewolf is still out there, hunting Ellie and Jimmy and making everyone around them pay. Having never seen it in theaters, I can’t tell you what is different about this version of the film–except of course for those buckets of blood the old men and Soccer Moms on the MPAA just love to hate, but I found this to be a fun movie, one that was not made to be taken seriously. Those critics who were looking for serious, dark horror, and said the movie was a mess of clichés instead? Well, they missed the point of this picture entirely. I mean, Craig Kilborn and Scott Baio both play themselves here. How the hell could you think this was supposed to be a serious effort? Sure, Cursed has its eye rolling moments–like the werewolf who actually flips off a character, and its certainly not original, but with all the PG-13 dreck that the studios are shoveling into multiplexes these days under the guise of Horror, it is easy to appreciate Wes Craven and Kevin WIlliamson’s efforts here. They know how to set the mood, how to establish the basics of plot and character, how to keep the pace quick and the action moving, and–most of all–how to have some fun with the material. Cursed is a movie who’s only goal is to see that you have a good time while you’re watching it. In this age of garbage like Boogeyman, what’s wrong with that? Director Tim Burton has been off his game as of late. His Planet of the Apes remake featured great Rick Baker make-up and nothing else to recommend it (don’t even get me started on that ending!). His Big Fish was a disappointment to a much lesser extent, but a disappointment non the less. However, the director’s track record when teamed with Johnny Depp (Edward Scissorhands, Ed Wood, and Sleepy Hollow) has been perfect. And so I held out great hope for this film. At first glance, you would think that this duo had delivered us a sweet Technicolor children’s film–what with its candy landscapes, its cast of kiddies, and its singing and dancing Oompa-Loompas (more on them later). Peel off the wrapper, however, and you’ll find this Chocolate Factory to be very dark indeed. This is a deliciously perverse, deeply disturbing, and mean-spirited tale. Needless to say, I thought it was fabulous. Depp plays Roald Dahl’s demented candy man Willy Wonka–a wealthy inventor who has lived for over 15 years locked away from the world inside his workshop. One day, he sends out packages of Wonka Bars that contain Golden Tickets. Anyone who finds these tickets gets to visit the chocolate factory and has a chance to win an incredible prize. One catch: there are only 5 tickets in the entire world. Charlie Bucket (Freddie Highmore, who co-starred with Depp in last year’s Finding Neverland) thinks his chances of finding one of these all-access passes are slim. You see, his family is so poor that he only gets one chocolate bar a year–on his birthday. Miraculously, he does find one, however, and he happily joins the four other children (all of whom are insufferable) on this once in a lifetime tour. When they’re locked inside the factory walls, however, they find that this sugar-spun world is a dangerous place indeed. Depp’s Wonka looks like a cross between Michael Jackson and Buster Brown with his flamboyant dress; his white, pasty face; his big, white, perfectly straight teeth (Wonka’s dad–the great Christopher Lee–was a dentist); his widened pupils, and his truly goofy haircut. And then there’s that silky, high pitched voice of his. It’s a far cry from Gene Wilder’s take on the character in the 1971 musical Willy Wonka & the Chocolate Factory. If you grew up with that film as I did, you might have picked up on the fact that Mr. Wonka is a bit twisted. Depp takes the creepy seeds Wilder planted in the original and gives them Miracle Grow. The result is a much more sinister Willy. With every room they enter, Depp looks at the children the way a spider eyes flies headed toward its web. As each child falls prey to another of his traps, his lips curl into a sick, sadistic grin. You can clearly see the delight he takes in torturing spoiled Veruca Salt (Julia Winter) and her naughty friends. In addition to the menacing Depp, Alex McDowell’s production design for Charlie is something to behold. From the collapsing shack young Bucket and his destitute family call home, to the candy-coated caverns of Wonka’s otherworldly abode, there is always something amazing to look at on the screen. And then there are the afore-mentioned Oompa-Loompas (all played by a digitally shrunken and multiplied Deep Roy). These cocoa-loving Pygmy workers come from far away Loompaland and have a flair for production numbers. You heard me: production numbers. After each bad child’s punishment comes a new and exciting dance sequence. Burton’s friend and long-time collaborator Danny Elfman takes the chants from Dahl’s book and sets them to four different styles of music, making this Chocolate Factory a treat for the ears as well as the eyes. This is one of Director Tim Burton’s best efforts–a malicious treat for the twisted child in us all. If it is successful, perhaps Warner Brothers will give Depp and Burton a chance to take on Dahl’s second Charlie novel: Charlie and the Great Glass Elevator. I hope they do. Call me a glutton, but now that I’ve had my first taste of this world, I want more! “Would you like me to come for your kidney now?” the ominous voice on the cell phone asks. Can anyone tell me why people in thrillers even bother to answer the phone?–especially when they know someone is after them and the caller ID says “Unknown Caller”? Koma is advertised as an Asian horror movie. Your video store will probably even have it with Ringu, Dark Water, and Ju-on. Sorry to dissapoint you. While it does have some tense moments, even some gory moments, it is in reality a psychological thriller in the same “is she the killer or isn’t she” vein as Basic Instinct. Ching (Angelica Lee) gets drunk at a friend’s wedding and stumbles down the hall. Wouldn’t you know it, out of all the many doors she could have used for support, she happens to lean on the one that opens onto a crime scene. It seems that a naked woman has crawled from a tub of ice and now pulls herself across the floor in a pool of her own blood. Yes, the old urban legend is true: somebody is out there stealing kidneys for sale on Hong Kong’s black market. But who is it? As Ching is running away, she runs into a strange woman, a woman she later points out to police on the playback from the hotel’s security camera. Now here’s where the plot really thickens. It seems that this woman, Suen Ling (Karena Lam), is having a torrid affair with Ching’s boyfriend, Dr. Fung (Andy Hui). When the police find out, they think the identification was part of a lovers’ quarrel and dismiss all charges against this mysterious woman. Then Ching begins receiving calls on her cell phone. It’s a woman’s voice…a woman who threatens to now remove her kidney. Is this Ling? –or is someone else responsible? Perhaps Dr. Fung? Or maybe it’s that strange guy at the bar? If you’ve seen any Joe Esterhaus thriller, you know the drill. Koma works best when it stops trying to scare us with cheap tricks (people suddenly coming up to a car window and beating on the glass in the rain, accompanied by the required musical stinger) and explores the loneliness of its main characters. The performances here by Angelica Lee and Karena Lam are top-notch. Those who have seen the superior Asian thriller The Eye know that Lee plays a terrified victim quite convincingly, but here she also adds a hurt desperation that makes your heart really ache for her. Karena Lam does a fine job at playing the standard movie psycho babe from Hell, but her best work in the film is in the quieter moments when she openly reveals her loneliness to Ching and even grows to have an uneasy friendship with her. In fact, both characters appear to be the same coin. One will be showing heads and the other tails, and then they flip-flop. The direct translation of Koma from the Chinese is “help,” and these characters are both in dire need of some professional assistance. In the climax, it is interesting to see these actresses turn what might have been a cliched mess into something that is truly thrilling to behold. If you’re looking for a twisted tale of bloody terror, this is not the film you seek. But, if you want a well-acted character piece with some horrific elements and an original ending that will leave you thinking, I would give Koma a solid recommendation.